Emil Messina, my barber of many years, told me in the video that he'd work until "the day comes." Today, I found out, that day came. Some family health emergency, I was told, and then he retired. That's all anyone at the Oak Park Arms could tell me when I called for an appointment this morning. The front desk said a new barber would be taking over this coming Sunday. Emil worked at the Palmer House ("the world's biggest barber shop, 100 chairs") before he moved into a shop in the Oak Park Arms. He had cut the hair of Liberace, Jack Benny, Tony "Doves" Aiuppa, Murray "Camelback" Humphreys, and me. During haircuts, we'd share our casual philosophies about gardening, marriage, and food, always food. Just two old Italian guys talking about things that were important to them, and being Italians, that was usually food. My barber, Emil Messina of the Oak Park Arms, is a fellow Italian-American and he told me that his wife frequently uses neck bones for sauce. "I can always tell if she didn't use neck bones for the gravy," Emil explained to me, "so I ask her, 'Did you put neck bones in here,' and if she says "I didn't have any," I say 'Why the heck didn't you tell me? I would have picked some up!'" Neck bones provide the sauce with both flavor and body. Given the relatively high collagen in animal joints, the bones of the neck – much like the bones of the feet and back – help thicken the sauce and provide texture and mouthfeel. Emil tells me that at holiday dinners at his house, his grandchildren always eat the neck bones first – "They love 'em," he said, adding "there's a lot more meat on them than you might think." Lots of times, we'd talk about the food he had growing in Italy, about what his mom used to make, how his dad made wine in their basement, what food he liked as a kid. Once, after I got back from a trip to Italy I mentioned to Emil that I had eaten snails in his homeland. I asked him if he liked them. I think he actually got a little misty, and there was a catch in his throat when he said, "I love 'em. Love 'em." He used to hunt for them as a kid. 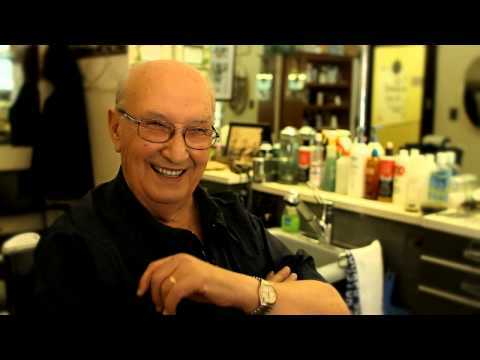 Though it didn't make the cut in the video edit, during this interview Emil also told me about his days as a barber surgeon in Sicily. Barber surgeons used a cup-like mechanism to draw blood from the backs of patients. This practice was advertised by the blood red strips on the traditional barber pole. The belief since the medieval era was that letting blood rebalanced the "humors" in the body and could "cure" the common cold and other complaints. When Emil came to the US, he discontinued his surgical practice. And now, he's discontinued his hair-cutting practice, and I know that a lot of people are going to be very sorry to see him go. Some of us will also be a little hairier for a little while. Emil told me a lot of stories about his life in Italy. One day he asked, "Did I ever tell you about the olive tree that saved my life?" I said he hadn't but, man, did I ever want to hear that one. Emil told me that when he was living in Sicily during WWII, the Germans, allies of Italy, had encamped outside his small town. As he was biking home one day, American plans swept down and began strafing the German camp. Emil saw the planes coming in his direction, so he pulled his bike over and hid under a tree. Bullets whizzed about his head, branches and leaves, snipped by gunfire, fell all around him…but he was unscathed. He biked home. "Every time I go back to Sicily now," he told me, "I visit that tree. Because that's the olive tree that saved my life." Our neighbor, Gene J. had his hair cut by this man and loved him. He was such an interesting man. We'll keep Emil in our prayers.